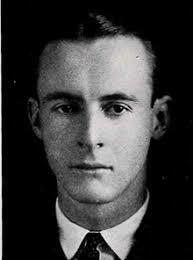 Jeb Alexander is the pseudonym of Carter Bealer, who was born today, October 17, in 1899. His life is recounted in Jeb and Dash: A Diary of Gay Life 1918-1945. The book is the diary of Bealer (Jeb) edited by his niece, Ina Russell. Dash is the pseudonym of Isham W. Perkins. In 1908 Jeb moved with his family from Atlanta, Georgia, to Washington, D.C. From 1918 to 1922 Jeb attended Washington and Lee University, in Lexington, Virginia, where in 1919 he met Dash (aka Isham). Jeb worked as proofreader and editor at the Government Printing Office, Washington, D.C.From 1912 to 1964, he kept diaries chronicling his life and his relationship with Dash and others. He wrote in fascinating detail about his life in DC, and what it was like being a gay man in the early 20th century. Among some of the events chronicled in those diaries, while at Washington and Lee University, Dash had another boyfriend, Harry Agneau, who committed suicide when he and Dash were expelled due to their relationship being unveiled. In that period, Jeb's boyfriend was Randall Hare, a married man. The book also chronicles the time when Jeb and Dash took a trip to France at the outbreak of World War II--not the best of timing. Jeb died on May 11, 1965, in Washington, D.C. I have never heard of him or his writings. I may have to investigate further ... thanks for enlightening me.